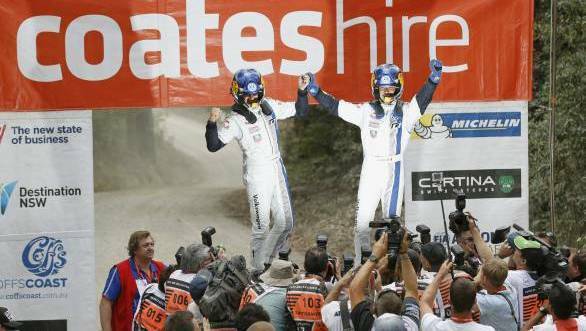 Sebastien Ogier's win at Rally Australia had already convinced the world that he would clinch the 2014 World Rally Championship title. However, Ogier and the rest of the Volkswagen crew weren't popping the champagne yet. After all, Thierry Neuville still had a mathematical chance of winning the championship. Rally France would then serve as the platform for the Ogier to win the title. And that's exactly what happened. At the Power Stage at Alsace, all Ogier had to do was win - the three points he'd get from the win would be enough to clinch the 2013 title. Win he did, resulting in Seb replacing Seb as World Rally Champion. Although it was almost a certainty that Ogier would be the one who took the WRC title this year, the Frenchman wasn't willing to leave things to chance, declaring that even the 'mathematical possibility' that the win would go to someone else was reason enough to be cautious. Needless to say, Ogier was relieved and overjoyed at once after clinching the championship, declaring that if he could, he would 'give everyone in the world a big hug'. Meanwhile, also ecstatic was Julien Ingrassia who clinched the co-driver's championship. Meanwhile, Jost Capito, Volkswagen's Motorsport Director declared that the win wasn't only important for Ogier and Ingrassia, but also probably the greatest achievement in Volkswagen Motorsport's history, given that they won the title in an all-new car, the Polo R WRC.